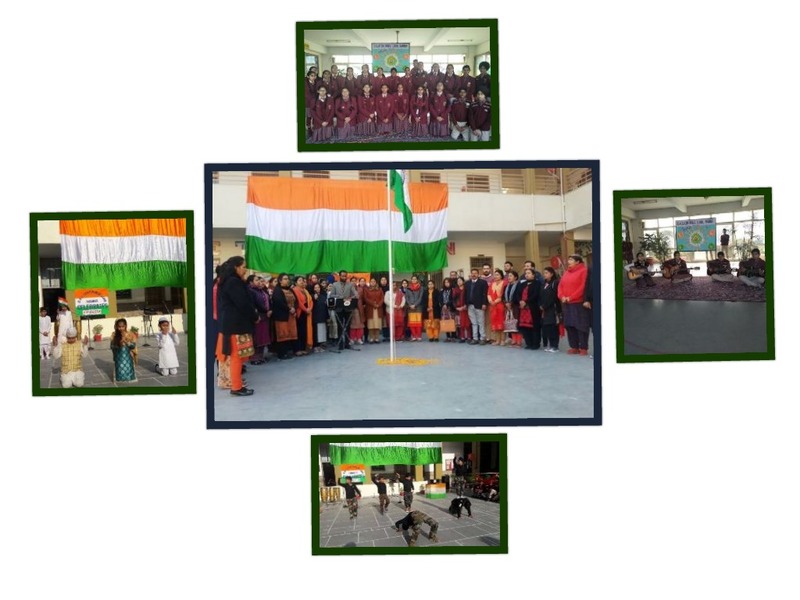 On 25th January 2019,Republic Day was celebrated in the premises of DAV Centenary Public School,Nabha. A well organised function was there under the able supervision of the Principal Miss. Meena Mehta. The commencement of the function was made with the enchanting of Vande Mataram.Afterwards the students of class 8 delivered a speech throwing light on the importance of Republic Day. One more child presented a poem in Hindi which was appreciated by everyone. Students also presented their views on the same. Students of music choir also presented some patriotic songs which made everyone feel rejuvenated.They all sang with gusto. The wordings of the patriotic songs made such an environment that everyone was filled with patriotism. There was a special presentation by the students of class 8 and 10, they sang a melody by playing guitars.It was a unique and fascinating show which was appreciated by all the teachers. Republic Day was also celebrated in Junior wing under the guidance of our worthy Principal Miss Meena Mehta with unprecedented patriotic fervour. A gamut of celebration activities held on the campus consisted of special morning assembly in which students recited patriotic poems and speeches on the importance of Republic Day .Manvir Singh and Imrose of of Class V and IV gave a dynamic performance by singing a patriotic song reminding us of the sacrifices made by the revolutionaries Shaheed Bhagat Singh and Chandershekhar Azad in a very melodious voice and made everyone stunned by their performance .Then there were speakers who through their speeches displayed the precious contribution of great freedom fighters. A play on ‘Unity in Diversity ‘was presented by Class 2 students followed by mesmerizing dance performances by the students. With a couple more cultural items, the function ended with national anthem. During the culmination of the event, the Principal gave a speech reminding the students and the teachers of the sacrifices made by our great freedom fighters and made us take pledge that we would serve our motherland, India with heart, body, and soul to bring it glory and laurels with our dignified deeds. She also uplifted morale of all the participants by praising about their active participation in the event. She encouraged rest of the students to come forward to groom their own personality by participating in various activities which are held or organised in the school.